i’d played early DS title magnetica about a year ago, and although i enjoyed it overall and played it somewhat obsessively, it didn’t really leave a huge impact on me. however, tokyo crash mobs, for 3DSware, which features similar gameplay, immediately caught my eye with its visuals. its premise is that the pieces are people and that your character throws people at them in order to get rid of them in order to either try to be the first in line for an event or to try to prevent them from hitting a mysterious red button. 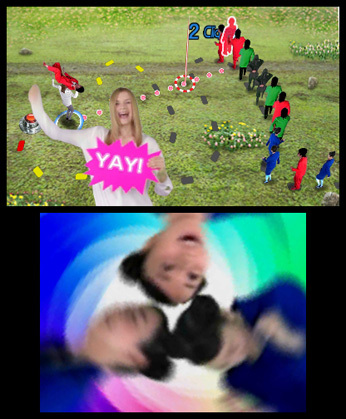 the game uses photos instead of sprites and includes tons of silly videos. It’s impressive that the developer has managed to include so much full motion video in this release, but to be honest the videos themselves are rather creepy, and eminently skippable. Aside from raising a wry smile the first time you see them, they add nothing to the overall experience. Regardless of what it all means, Tokyo Crash Mobs shows that Nintendo is willing to get weirder than ever. I couldn’t be happier about that. …While the game’s FMV portions are clearly the star of the show, the underlying game here offers an admirable attempt to make a relatively tired puzzle formula feel fresh and fun again. i was pretty impressed with the variety of gameplay they packed into this title. there are three basic forms of gameplay: one (grace’s mode) in which you “throw” people and thus can position pieces exactly where you want on the board; one (savannah’s mode) in which you “roll” the pieces and thus have to wait for people to jump out of the way before moving a piece behind them; and one (boss mode) in which you physically move the 3DS around to aim and dodge attacks by brightly colored ninjas by quickly tilting the 3DS to the left or right. the game makes great use of its central conceit both with its power-ups as well as some completely unique hazards, like “line cutters” who will try to insert themselves unless you throw a person at them to get them out of the way. at some points the people will also fidget and shift into new positions, which keeps the game feeling fast-paced. in my comments on magnetica i had said that “the gameplay focuses attention on your ability to put a piece where you want it to go, which takes away from the immediacy and tactility found in almost all other puzzles games of this type.” that game has controls like bust-a-move, aka puzzle bobble in that you have to flick the ball where you want it to go. tokyo crash mobs has a different control entirely. instead of having the controls and the board appear on the same screen, the board appears on the top screen and the controls are on the bottom screen. instead of flicking balls, you use the stylus to move your cursor to the position you want to throw (or roll) and then release. at first the game felt awkward since the controls were separate from the board, but the game shows a silhouette of where the piece will land and once i realized the touchscreen was really functioning as a controller, like a computer’s mouse, it made perfect sense and felt perfectly natural. having the board on the touchscreen with the same mechanics would have made the game a little too easy, not to mention force it to lose out on the glasses-free 3-d visuals. positioning pieces exactly where you want them is only slightly more awkward than if the pieces were balls instead of sprites of people and the “rolling” mode is definitely more challenging than the “throwing” mode, but otherwise i had zero complaints about the controls. the game features your standard story (which alternates the rolling and throwing modes and has only a few boss fights) and endless modes. one thing most reviews don’t mention is that after you beat the story mode, a harder story mode unlocks featuring much tougher time constraints. all in all this has been a definite highlight of the 3DS’s eshop, and for people familiar with the puzz loop series, a definite evolution and a nice example of a worthwhile sequel that introduces a significant number of new (and fun) elements.